In the spring of 1918 large numbers of soldiers in the trenches in France became ill. The soldiers complained of a sore throat, headaches and a loss of appetite. Although it appeared to be highly infectious, recovery was rapid and doctors gave it the name of 'three-day fever'. At first doctors were unable to identify the illness but eventually they decided it was a new strain of influenza. 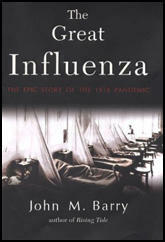 The soldiers gave it the name Spanish Flu but there is no evidence that it really did originate from that country. In fact, in Spain they called it French Flu. Others claimed that the disease started in the Middle Eastern battlefields, whereas others blamed it on China and India. A recent study argued that the disease was brought to the Western Front by a group of USA soldiers from Kansas. For the next few months soldiers continued to be infected with the virus but there were very few fatalities. However, in the summer of 1918, symptoms became much more severe. About a fifth of the victims developed bronchial pneumonia or septicemic blood poisoning. A large percentage of these men died. Others developed heliotrope cyanosis. Doctors were able to identify this by the bluish condition of the sufferer. Over 95% of those with heliotrope cyanosis died within a few days. This second-wave of the epidemic spread quickly. In one sector of the Western Front over 70,000 American troops were hospitalised and nearly one third of these men died failed to recover. By the end of the summer the virus had reached the German Army. The virus created serious problems for the German military leadership as they found it impossible to replace their sick and dying soldiers. The infection had already reached Germany and over 400,000 civilians died of the disease in 1918. The first cases of the influenza epidemic in Britain appeared in Glasgow in May, 1918. It soon spread to other towns and cities and during the next few months the virus killed 228,000 people in Britain. This was the highest mortality rate for any epidemic since the outbreak of cholera in 1849. 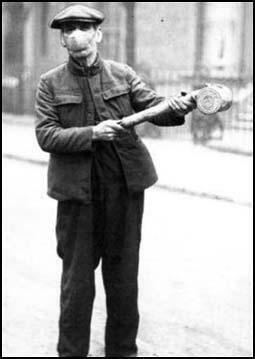 In Britain desperate methods were used to prevent the spread of the disease. Streets were sprayed with chemicals and people started wearing anti-germ masks. Some factories changed their no-smoking rules under the mistaken impression that tobacco fumes could kill the virus. Others believed that eating plenty of porridge would protect you from this killer disease. However, despite valiant attempts, all treatments devised to cope with this new strain of influenza were completely ineffectual. The USA was also very badly affected by the virus. By September a particularly virulent strain began to sweep through the country. By early December about 450,000 Americans had died of the disease. The country that suffered most was India. The first cases appeared in Bombay in June 1918. The following month deaths were being reported in Karachi and Madras. With large numbers of India's doctors serving with the British Army the country was unable to cope with the epidemic. Some historians claim that between June 1918 and July 1919 over 16,000,000 people in India died of the virus. 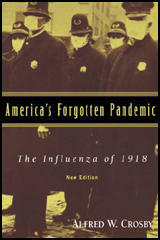 It has been estimated that throughout the world over 70 million people died of the influenza pandemic. In India alone, more people died of influenza than were killed all over the world during the entire First World War. (1) On the 3rd November, 1918, the News of the World suggested several anti-flu precautions. Wash inside nose with soap and water each night and morning; force yourself to sneeze night and morning, then breathe deeply; do not wear a muffler; take sharp walks regularly and walk home from work; eat plenty of porridge. (2) The wife of J. L. Garvin died of influenza in 1919. Her daughter, Katharine Garvin, wrote about it in 1948. We heard of the Armistice the day before it was made public. On Armistice Day itself, she and I went alone to London. I remember her crying and crying through all the rejoicing, and saying: "It is too late for me." Nearly three months later, she died, in her sleep, after a bad attack of the influenza that had overrun England after the war. She was a war casualty. The doctor had been in the morning, and had said she was better. But at some time in the late afternoon of Christmas Eve, the eve of her forty-third birthday, her heart gave up, and she went. My father found her as she lay in bed. It was a more terrible thing for him than he had left to her. He was totally incapable of dealing with a large family, house and kitchen; and he felt his loss more and more. Year after year, I saw him break into uncontrollable tears when he mentioned my mother. The grief become more intense with the years, and not less. It was alarming to see him cry, but I learned from it that the more manly, the larger the man, the more he can let his tears flow without false shame. Influenza as a bioweapon does not sound like a particularly grave threat. Annual outbreaks kill many people, particularly the elderly; but a case of the flu is generally perceived as an uncomfortable nuisance rather than a grave threat. But flu viruses can be devastating. In 1918 and 1919, the so-called "Spanish flu" killed an estimated 20-40 million people worldwide and, since then, the highly changeable flu virus has resurfaced in a variety of particularly virulent forms. The strain of influenza virus that caused the 1918 global epidemic ("pandemic") was exceptionally aggressive. It showed a high capacity to cause severe disease and a propensity to kill fit young adults rather than the elderly. The mortality rate among the infected was over 2.5%, as compared to less than 0.1% in other influenza epidemics. This high mortality rate, especially amongst the younger, lowered the average life expectancy in the USA by almost 10 years. The 1918 pandemic killed as many as 40 million, while the later outbreaks, while less serious, still claimed millions of victims. Coming so hot on the heels of the Great War, the 1918 pandemic was the worst epidemic, at least in terms of numbers killed, in recorded history. The bubonic plague of the 1300s killed fewer people - but came at a time of far lower populations. The mortality rate was more than two in every hundred who caught the disease. It is possible that the mass movement of soldiers at the end of the conflict helped it spread around the globe. Just like the latest virus, it is possible that the 1918 flu arose in China. The illness came on swiftly, turning to a form of pneumonia that could kill within hours of the first symptoms becoming apparent. Outbreaks swept through all the continents - in India, mortality was 50 deaths per 1,000 cases.